The existing “threats to peace, security, and stability of Yemen” listed in the report hint to the Hobbesian “state of nature.” The authority of the legitimate government is not only challenged in the north. It is also struggling to assert itself in the south, where the Southern Transitional Council (STC) has recently been formed. The STC seeks an independent South Yemen. And of course, the Huthis in the north “have now taken unilateral control of all State institutions within their territory.” The report goes on to mention the proxy groups funded by the Kingdom of Saudi Arabia and the United Arab Emirates in addition to terrorist outfits such as al-Qaida and the Islamic State. 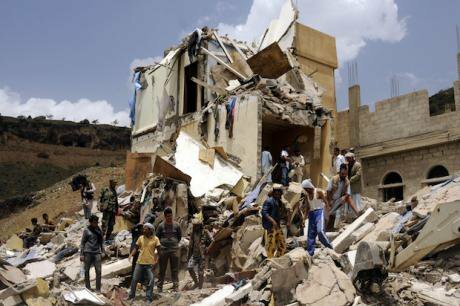 Yemen seems to be in a state of disarray. There are multiple enemies fighting the government but also fighting one another, and making the revival of the state almost impossible. The erosion of the Yemeni state and its authority is exemplified by the proliferation of different forces, which in turn have been inflicting death, pain, and suffering on innocent Yemenis. But is it the disappearance of the Yemeni state that has resulted in the suffering of Yemenis? Or was it rather the specter of the Yemeni State, making its presence felt in its most destructive articulation, which came back to haunt their everyday life? Carl Schmitt’s concept of the political may help us understand Yemen today. To him, the state as a political entity exercises the right to decide on the domestic enemy. When it constitutes the friend-enemy distinction it also affects the “utmost degree of intensity of a union and separation, of an association and dissociation.” This includes calling upon its subjects to be ready to kill or be killed in the name of securing peace and order within its territory. In Schmitt’s rendition, it is not the possibility of war with an enemy that constitutes the political but the nature of the friend-enemy grouping. And it is in the realm of the friend-enemy grouping that the state’s authority is exercised. Should a war materialize out of this grouping, then, according to Schmitt, the war itself is the normal state of the political. In 2015, it was in the name of the Yemeni state, that the Hadi government called upon the regional and international powers to intervene to protect the Yemeni state from falling at the hand of the state enemy: the Huthis, described as the agents of Iran. Earlier, in September 2014, it was the Huthi-Salih alliance who captured the state institutions in Sana’a claiming that they were protecting the integrity of the Yemeni state from the Hadi government which had become an instrument in the hand of the international-regional powers. Both factions declared each other as the ultimate enemy that needed to be liquidated. Both have mobilized their allies internationally, regionally and nationally, and are prepared to kill and be killed. Had the Yemeni state really ceased to exist, why then are both factions inflicting violence on one another and on innocent Yemenis in the very name of protecting the state? Does that not seem to indicate that the spirit of a dead state has been incarnated in its perpetual signification of the public enemy and wreaking of violence on Yemenis? Yemen as a state, with effective legal and constitutional norms, may well have ceased to exist. But its specter continues to haunt the lives and bodies of innocent Yemenis and subjects them to death, loss, pain, and suffering. The so-called international community is complicit in perpetuating this suffering on the Yemenis, and complicit otherwise in this state of affairs in Yemen. Yemenis have been denied even the right to recognize the brutality brought upon them on a daily basis. It is not the state that has ceased to exist. What has really ceased to exist, and perhaps even left behind no trace that would remind humanity that it once existed, is the ethical responsibility of the so-called international community, international law and the international institutions whose responsibility it is to prevent suffering and death. With such a state of indifference to their suffering and pain, Yemenis have been given the brutal gift of a spectral state that thrives and survives through violence, while they have been dispossessed – deprived of hope that a peaceful existence will one day arrive.